Chicken and Veggie Stir-Fry on new plates! Lisa made a stir-fry tonight — no particular recipe, she just used all the vegetables we had on hand — and we finally got to put Jenn’s fantastic plates to use! 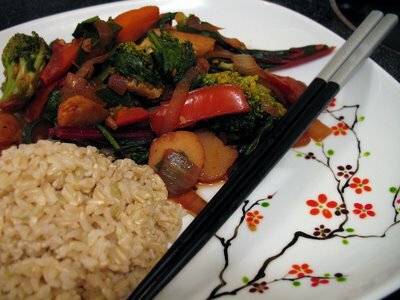 Lisa marinated the chicken in soy sauce, garlic and sesame oil, and shallots, and then stir-fried with carrots, onions, tomatoes, spinach, chard, water chestnuts, zucchini, and broccoli. Simple, fast, and mighty tasty. This entry was posted on Wednesday, August 29th, 2007 at 9:19 pm	and is filed under Asian, Main Dishes. You can follow any responses to this entry through the RSS 2.0 feed. You can leave a response, or trackback from your own site. You are here : Home » 2007 » Chicken and Veggie Stir-Fry on new plates!